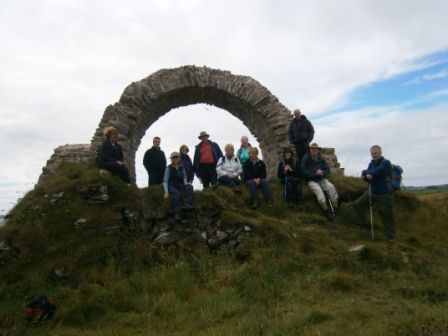 An eight mile costal walk from Garlieston to the Isle of Whithorn was the aim of 12 regular ramblers plus one potential new member on Saturday the 13th August 2011. A week of heavy downpours and an earlier shower may have persuaded some members to stay at home, but brightening skies made for a promising start from the village hall at Garlieston by 10am. Elaine, Frances, Isobel, Mary Mitchell and Mary Sloan, Richard, Andrea, Jack, Peter (Portpatrick), John, Audrey, Ken and a visitor, Tom, from New Galloway. I realized that I had forgotten my camera which was a real blow but I managed not to get uptight about it! Crossing the burn that flows from the Dowalton Loch, a light breeze from the sea aided a brisk start down the harbour side passing the new luxury flat development on the quayside. Keeping to the coastal tow path a few older cottages on the right were passed towards a gate bearing a sign saying “Rigg Bay one mile, Cruggleton Castle 2 ½ miles”. At the gate to the left a stone break water stretched out into the sea for some 200 yards, where two people were fishing off the end, perhaps for “Blockhans”. I remember reading in an old account of Galloway written for Sir Robert Sibbald by Dr Archibald who described the “Blockhan” as being “aboot the bigness of a white salmond-troot, of shape and colour of the lyth, but a drier fish”. Rounding a corner, a fork on the path afforded the option of sticking to the coast or entering into the beautiful Galloway House gardens. This was a no brainer for our many gardening enthusiasts, who after discussing the merits of the 18th century “haha” ditches surrounding the estate were in awe of the size and variety of the trees and shrubs. Galloway House was built by the 6th Earl in 1740 and it is said that he chose the site because nowhere else in the shire could he have his home surrounded by such fine trees. A hundred years later, the writer of the statistical account says, “in Lord Galloway’s pleasure grounds there are some beautiful specimens’ of laurel, evergreen oak, horse chestnut and Turkey oak. Among the more notable trees today are silver firs 10 feet high and some of the laurels rise to the height of 31 feet and are considered amongst the finest in Scotland. Larches measuring 12 feet and beeches 18 feet round the boles. In a clearing, two memorial stones and a bench to members of the Strutt family who owned the estate not so long ago were some statuesque palms of the Trachycartus Fortunii variety. This was a most appropriate place of rest with a tropical tranquillity. It has been noted that the soil here is peculiarly adapted to the growth of evergreen shrubs. The trees grow to the edge of the shore and shade the path running toward Cruggleston Castle. Emerging from the gardens, our next place of interest was Rigg Bay, although it has been advertised as ‘The Secret War’ museum in Garlieston where an exhibition shows the importance of Rigg Bay in the engineering and testing of the Mulberry Harbour’s used successfully for the Normandy landings during the Second World War. In previous years, concrete pillars could be seen from the beach, but no such structures are visible today. On reaching the recently renovated cottage at the end of the wooded area where a lady was getting it ready for the next holiday visitors, we observed the ripening apples on the trees in the garden and the sun glinting on the seas below and sitting on top of a huge cliff about a quarter a mile away was the newly renovated arch at Cruggleton Castle. It stands a clear cut half circle against the sky whether seen from the sea or the land. It is worthwhile going to see the cliff alone with its sheer fall of 200 feet to the sea. Cruggleton is one of the oldest castles in the county and was a place of great size and strength belonging to the Lords of Galloway. After passing through the hands of various owners it came into the possession of the Agnews of Lochnaw. According to Symson it was wholly demolished and ruinous by 1684. Peter took a group photo with his camera, the battery on its last legs, before we set off again. After lunch and a photo shoot in the ruins, we skirted a ripening field of wheat, crossing a field of cattle and another with barley towards Port Yerrock bay, where a lone swan was giving himself a good preen. The route then took us over a stile onto a road for a quarter of a mile where a sign pointing back towards Garlieston said 4 miles, denoting that we had reached our half way point. Passing Port Yerrock Mill on the right and Port Yerrock Farm on the left we reached a gate leading onto the beach where a French family were enjoying a picnic. 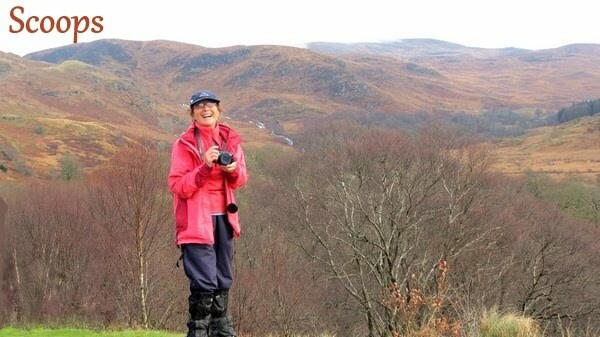 After negotiating a tricky, tussocky marsh, we left the beach and headed up through an avenue of trees to a gap in the wall leading to a grassy field. A fishing boat could be seen out in Wigtown Bay emptying the creels, a pair of Clydesdale horses, a very pregnant belted Galloway, lots of ladybirds and wasp like flies were the only other living creatures we met on the final lap. As we came over the last high point of the day we could see the white washed house in the village of the Isle of Whithorn glinting in the late afternoon sun. Many visitors come to the Isle as it has rich historical connections ranging from early Christianity to colourful smuggling stories. At very high tides the little spur becomes an island and at one time the harbour could be entered by one route and smaller vessels could clear by another. This enabled a heavily laden lugger from the Isle of Man to evade capture by a Revenue cutter much to the amazement of locals. When the tide had receded they found a track made by the keel on the shingly bottom about a hundred yards long. The full story of this incident is told by Mr Gordon Fraser in Lowland Lore. After refreshments at the Steam Packet we headed for the 4.15pm bus back to Garlieston. We caught the bus – it looked like something out of the 50’s but it did have a Y registration number – its tires looked the bit worse for wear though! There were only two of us paying a fare – the rest of us had our bus passes – there’s something to be said for growing ‘old’ I guess!